"That Tickles!!!" Sound familiar...Good, because you've arrived at the Elmo Kids Birthday Party Ideas Page. Where you are going to not only learn how to plan an Ultimate Elmo Party, but actually learn all about Elmo. Your child will be so amazed at how Elmo savvy you are by the time the party arrives. So pay attention and let's get going and start with the party location. I'll see you after you have planned your party and are finishing up with the Thank You notes. Have Fun! But before we get started, take a look at this great party pack. It includes just about everything for an Elmo Kids Birthday Party. * Elmo's Big Visit: Where could Elmo visit? How about your child? I know your son/daughter would be astonished if their party was at home and everything was in "Elmo" style. It doesn't seem as hard as you think, plus you are at your own home. You have full control of what happens, how it gets decorated, etc. But in order to bring Elmo to your home we're going to have to get started off on the right foot. So first, I would suggest checking out our selection of Clip Art and Coloring Pages. You will find so much information & pictures there you won't be able to use it all!!! Now what are the benefits of having a party at your home? You might be thinking NO WAY!!! But wait, first I know you won’t forget any crucial party items at your home (e.g. piñata bat). Second, that reservation won’t get screwed up…because you are already there! Finally, you know where everything is, how convenient. Now don’t get me wrong, you do run the risk of damage and such, but weigh the benefits and risks and pick what’s best for you! * "Elmo's World": Now here is your chance to take your child into a world they have never been in. How? Well simple...With the party ideas from this site you will be able to transform a simple park into "Elmo's World". With clipart, decorations, pictures, posters, games, etc...you will be able to share with your child a world that Elmo lives in. Now where should you have? A good location for a party is always a park. First, make a list of all the local parks in the area and write down the key features of each one. For example, how much area is available? is there a playground? trash can availability? Bathrooms? covered areas? Capacity of park? etc. You don’t want to show up at an overcrowded park, with no playground, no bathrooms and it start to rain. Spend some time in selecting the right park and I guarantee your party will run a lot smoother. Finally, get there a little early and setup your decorations to turn that park into Elmo's World!!! * Elmo's Day Out: Want to take Elmo, his friends and your child out on the town? How about renting an establishment to have the party? A lot of locations will provide you with invitations, discounts on food, a cake, etc. Make sure you find a decent place that provides you with enough stuff to balance out the cost. Don’t be afraid to ask for food discounts and other items, you will be surprised on what they will offer, but only if you ask! * Invitation Help: As you start to create this invitation masterpiece, don't forget to check out the Elmo clip art for lots of different pictures. They will help you design the inside and out. Good Luck! 1. "Elmo Loves You Party!" 2. "Travel the World with Elmo! " Before we get started, I have listed a few ideas on the design of the invitation and then I will give ideas on what to say inside. * Elmo Invitation #1: Take construction paper and make elmo heads. Fold the red paper into fourths and cut ovals (the shape of elmo's head - more football than oval). Then you have two invitations, two elmo heads. Then take white construction paper and make circles for the eyes, black circles for the pupils and orange "ovals" for the nose. Take a black marker and draw the sides of the mouth just a little ways up from the bottom of the face so that when you flip the head open, it appears that is Elmo's mouth. On the inside take black construction paper and cut it to fit inside like the elmo puppet. Then you can put your saying in Elmo's mouth. You can do that by either hand writing or printing it out on your computer in red ink. * Elmo Invitation #2: This is a simple and great invitation idea. Simply take a picture of your child doing something with Elmo. Then print the party details on 3 X 4" computer labels and stick them to the back of the picture. * Elmo Invitation #3: Another simple invitation idea: make a window with a window shade. On the window shade simply put one of the sayings below or pick one of your own. Elmo hopes to see you there! * Don't forget to add the RSVP, location, time, date, and other pertinent party information on the invitation. Picking out, setting up and fine tuning the decorations can be a long tedious process. But, there is hope, because with a little planning and creativity, it will be one of the most rewarding experiences of the party. I have compiled ideas that start with the outside decorations and finishes with the inside decorations. You can use all, some or none of the ideas, but no matter which ones you choose, they will help you turn your party location into the Ultimate Party Location. You can cut out a giant Elmo out of Red poster board and paste him to a white poster board. This is a great decoration to set out front for the children to see as they arrive at the party! Use sidewalk chalk to draw Elmo and his friends on the driveway. Let’s start with the simple decorating. Tie helium balloons of different shades of red, blue, yellow, black or white in clusters of 3 or 5 to the back of chairs or tucked into corners. Don't forget to tie a bunch of balloons to the birthday child’s chair. If you choose not to use helium, tie balloons to varying lengths of curling ribbon, and hang them from the ceiling or from light fixtures throughout the house. Next, let’s move on to another simple, yet familiar decorating item, Streamers. Streamers offer an economical way to splash lots of color around the site of the party. Create a fun and colorful effect by draping rainbow colored metallic streamers from the center of the ceiling to the walls on each side of the room. The streamers can be twisted after they are anchored to a ceiling wall or table for a more dimensional look. Two different colored streamers can be placed back to back and twisted for a unique look. After you are done, it should look like a spiral rainbow above the room! They also look terrific hanging from doorframes or cascading vertically down walls. Don't forget to check out this Elmo Loves You streamer. Make sure you put out all the Sesame Street items you have in your house. They really add to the party environment! Here is some great Happy Birthday confetti to place on the tables and around the party area. Another great idea is to print out some pictures from our Elmo Clip Art Page. Have them laminated and place them around the party area. Here is an awesome Elmo Happy Birthday Banner for the party. The colors of the party should be the primary colors (red, green, blue, yellow - like Sesame Street). After you have selected the party theme colors, decide on whether you will use either printed or solid color party tableware. Going solo on your party theme? Can’t find any party theme tableware you like? Then take a look at the silverware, plates, napkins, etc in solid colors. You’re guaranteed to find a color that matches your theme. Now that you have picked out the location, selected a few decorations and picked the theme colors and party tableware, what is your child going to wear to the Elmo Theme Birthday Party? 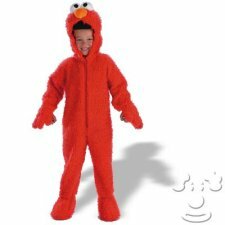 Wouldn’t your child love to dress up as Elmo? I know they would, so here is a perfect chance to let them. Check out these Ultimate costumes!! First, check out these great Face Paint Crayons. You could decorate the children however you want!!! 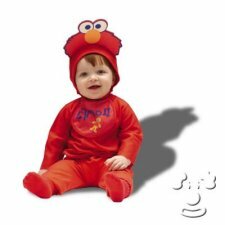 Here are 2 great Elmo Costumes for your child to wear at their Ultimate Theme Birthday Party. Just click on the image to view. A simple game of Fish, Fish, Elmo (i.e. duck, duck, goose) is a great ice breaker activity. You can keep adding children to the circle after they arrive. I have yet to find a child who doesn't like this game, it’s a classic!!! Freeze Dance is another great game to get kids acquainted. The game doesn't require a certain number of kids, so they can join in as they arrive. Play the Elmo soundtrack as the kids dance. If you stop the music, they must freeze. If they don’t freeze, they are out. The game restarts after all the children have been eliminated except one. Kids love to dance and play games, which makes this an Ultimate Ice Breaker Activity. Deciding on whether you are going to make or buy the Ultimate cake is a tough decision. It mainly depends on how much time you have and how many guests are coming. I would suggest for a smaller party, you try and make that Ultimate cake. But if there is going to be a large number of guests, maybe a large cake made by the baker would be the best decision. 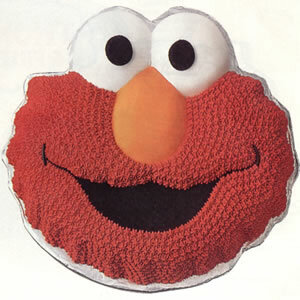 It’s up to you, but here are some ideas on making an Ultimate Elmo cake. * Elmo cupcakes - First ice the cupcake with red icing. Then for the eyes you use two large dots of white icing. Then add small black dots in the middle for the rest of the eyes. Finally add an orange triangle for the nose. Click on these Ultimate Cakes for the directions on how to make them. 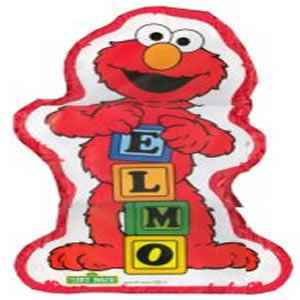 Click here for the Ultimate selection of Elmo Toys. Need something besides an Elmo toy? Click here for the Ultimate Kids Birthday Party Ideas for toys. 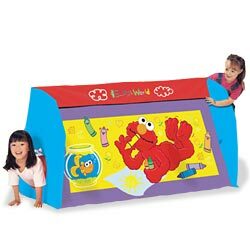 Looking for the Ultimate Elmo Games and Activities? Great, I have dedicated a whole page for these games. I know you will find enough choices to fill the games section of your Ultimate Elmo Party. Before we get to those games, check out this Ultimate Piñata. Your child will definitely love it!!! Does this piñata not quite fit your Elmo Theme Birthday Party? Click here for the Ultimate selection of birthday piñatas. Now it’s time for the Ultimate Elmo Kids Birthday Party Ideas for games. Check them out here. Now the parties over, what do you do? Start planning the next one? Sure, but you don’t want to forget about the guests that helped you celebrate your child’s birthday. Make sure to send out some type of Thank You note. Whether it is store bought or hand made, just make sure to get it out no later than a week after the party. Also, if you took any pictures at the party, make sure to include one in each invitation. 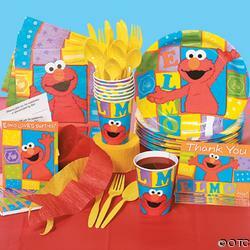 Any Thank You note you choose will end an Ultimate Elmo Kids Birthday Party Ideas Party.